For better performance, a good bounding volume structure is necessary. Axis-Aligned Bounding Boxes provides a very nice and quick approach for detecting ray collision. We only need to care about whether the object has been hit, and not the point or the normal for that object. The biggest issue with using AABBs is that they need to be recreated every time the object changes orientation. Fortunately, we do not have to consider that issue in a “offline” ray tracer. Most people use the “slab” method, which is based on the observation that an ​n​-dimensional AABB is just the intersection of ​n​ axis-aligned intervals. 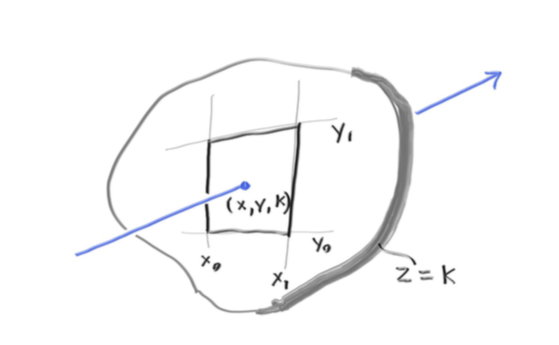 For a ray to hit one interval we first need to figure out whether the ray hits the boundaries. For example, this is the ray parameters ​t0​ and ​t1 in 2D. That equation applies to all three coordinates. 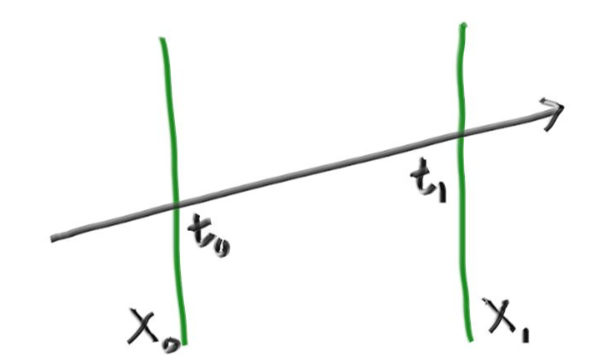 The key observation to turn that equation into a hit test is that the t-intervals need to overlap for each “hit”. This is incredibly simple, and the fact that it still works in 3D is exactly why we love it. The secret of a successful Motion Blur implementation is in the ray tracer’s camera implementation. We generate rays at random times while the shutter is open and intersect the model at that one time. Although the object is moving, each ray we generate exist at exactly one time. This way the core of the ray tracer can just make sure the objects are where they need to be for the ray. This method is introduced by Rob Cook in 1984. To get cool solid textures, most people use some form of noise. One of the most used noise is Perlin noise, named after inventor Ken Perlin. I used Andrew Kensler’s explaination of perlin noise to implement the perlin texture (http://eastfarthing.com/blog/2015-04-21-noise/). We first tile all of space with a 3D array of random numbers and use them in blocks. We then use hashing to scramble the arrangement of the tiles. One thing nice to add to the ray tracer is smoke. This is sometimes called “volume”. A very nice approach is to make a volume a random surface. A bunch of smoke/fog can be replaced with a surface that probabilistically might or might not be there at every point in the volume. Think about a volume of constant density. A ray going through a volume can either scatter inside or make it all the way through. How far the ray has to travel through the volume plays a role in determining how likely it is for the ray to make it through. where C is porportional to the density of the volume. 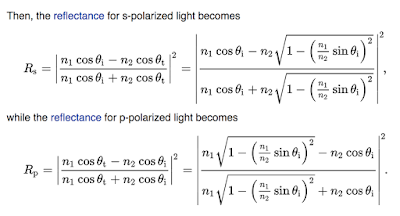 A serious practical limitation of ray tracing algorithms is that they are often very sensitive to numerical precision. If there is bad or white “acnes”, that means a bad might have killed a whole pixel. The sample might be NaN or a huge number. 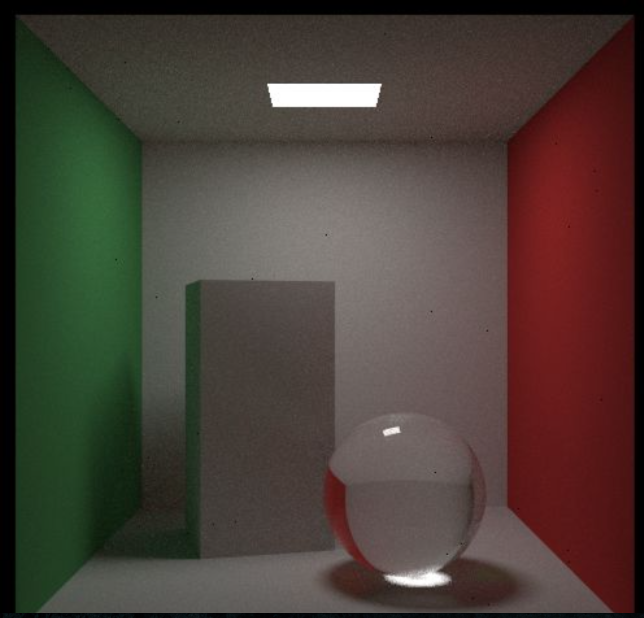 Peter Shirley introduces a nice hack in his third book of the Ray Tracing series. He mentioned that any “if” statement test with a NaN in it is false. This means we can apply a nice trick.